Have you ever needed a little gift for someone that was quick and easy to put together and just plain cute? I thought this would make a cute little birthday gift. . .especially for someone who likes to bake. 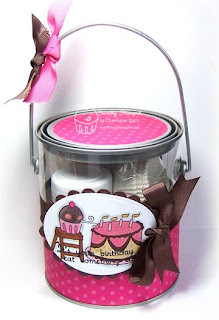 It's a little acrylic paint can filled with the dry ingredients and recipe to make mini cupcakes! I filled the can with a Jiffy muffin mix because they're small enough to fit in the paint can. 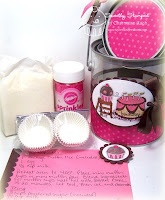 I added some powdered sugar (for the icing), mini baking cups, pink sugar sprinkles and a recipe card. All the recipient would need is a mini cupcake pan and the "wet" ingredients! The paint can was quick and easy to decorate. I cut a 2.5"x12" piece of patterned paper to wrap around the can. I used my Coluzzle to cut a circle for the top of the can. Then I stamped and colored my focal piece, cut it out with oval Nestabilities and attached it to the can with ribbon and adhesive. Everything about this gift is little and cute. . .perfect for the sentiment "It's your birthday. . .eat something cute!" darling idea, Taylor...who wouldn 't want to receive this cute little paint can filled with goodies! Love it! another adorable project, Charmaine...love it! Dang this is cute girl!!! Such a wonderful idea! This would be super cute for Christmas gifts too! So cute! My nieces are all out of town and love to bake. This would be perfect to send them some Auntie love via USPS. Thanks for the great idea! What a perfectly delightful gift - love it! What a cute idea and wonderful gift. I love it! This is darling! Thanks for sharing.